This is the only reference of its kind that addresses the use of probability theory to quantify the management appraisal process. Using Value-Based Risk Management (VBRM) it illustrates how management executives set quantitative goals and monitor the goals using tactical plans and unique control charts. Once preliminary goals are set, the probability of achieving them is determined and the attention of management directed to actions that can improve opportunities and reduce bottom-line risks. 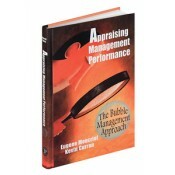 This book takes the subjective judgment out of the appraisal of company managers and employees, and is perfect for human resource directors and senior managers looking for a better way to appraise employees. • Contains concise tactical plans for controlling management and employee activities. • Provides unique “clothes-line” charts for monitoring performance. • Includes probability profiles showing the probability of achieving goals. • Illustrates goal elements through management action charts, which if properly managed can improve opportunities and reduce risk to the bottom line. • Features three separate chapters illustrating the use of the VBRM Appraisal process to production, service, and not-for-profit enterprises.